“Movistar has had some great results at the Santos Tour Down Under through the years too - winning the team classification in 2011 and in 2013 rider Javier Moreno won the King of the Mountain jersey." The top ranked UCI WorldTour team, Spain’s Movistar Team, lead a strong contingent of European starters in the 2017 Santos Tour Down Under. Movistar Team, which finished the 2016 UCI WorldTour season in first place for a fourth consecutive year, has confirmed its rider roster for next year’s season. In 2016 Movistar won the Tour de France team classification with consistent strong performances since forming in 1976. Santos Tour Down Under Race Director Mike Turtur said Team Movistar was in good form, and that the European squads enjoyed coming to Adelaide for the first WorldTour event of the calendar year. 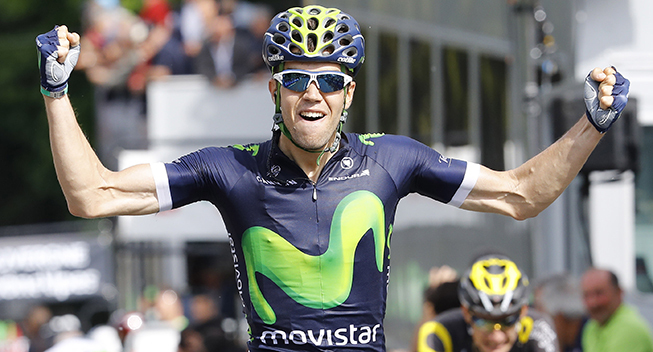 “To be the top ranked team for four years running is a great achievement for Movistar,” he said. “Movistar has had some great results at the Santos Tour Down Under through the years too – winning the team classification in 2011 and in 2013 rider Javier Moreno won the King of the Mountain jersey. The Movistar Team rider roster competing at the 2017 Santos Tour Down Under will be led by Team Manager Jose Arrieta (Spain) and includes riders Jasha Sütterlin (Germany), Jose Herrada (Spain), Jesus Herrada (Spain), Carlos Barbero (Spain), Gorka Izagirre (Spain), Victor De La Parte (Spain), Carlos Betancur (Colombia).